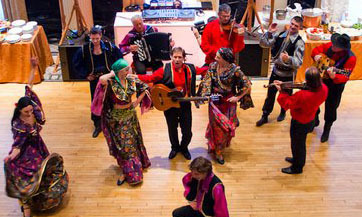 Gypsy Roma (Romani) dance, acoustic music, and song ensemble "Moscow Gypsy Army" established in New York City, USA in 2001. 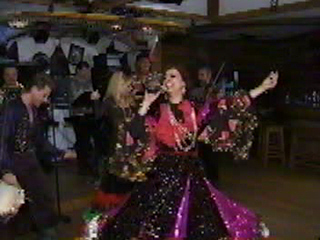 The group performs Gypsy standards including "Dark Eyes", "Two Guitars", classic pieces including "Chardash", ballads, tangos, waltzes and a growing number of popular songs. 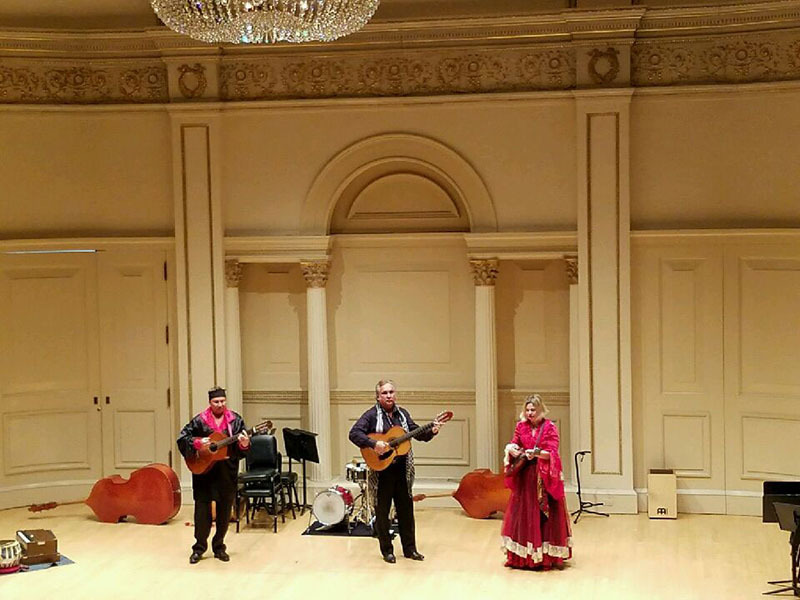 In September 2016 the company was invited to perform during New York Gypsy festival at the Carnegie Hall in New York City. 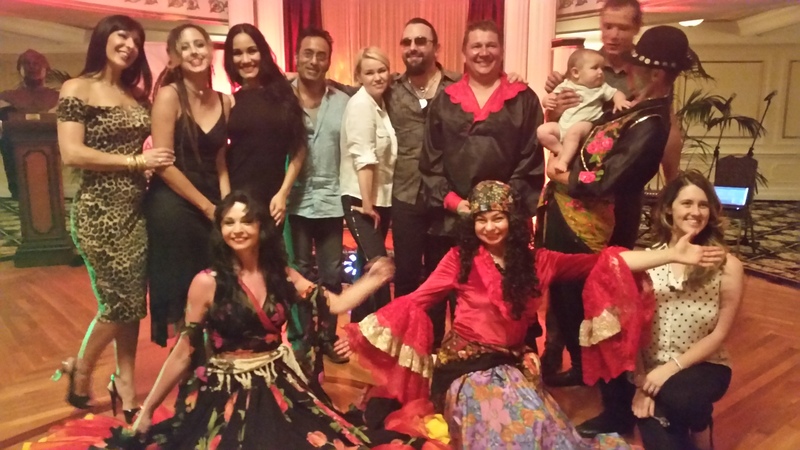 The show was invited to perform at the Untermyer Gardens in Yonkers, New York for the summer series of international and ethnic music and dance, lavish wedding of Anna Anisimova (a.k.a Russian-American Paris Hilton), the daughter of Russian aluminum magnate Vassily Anisimov. 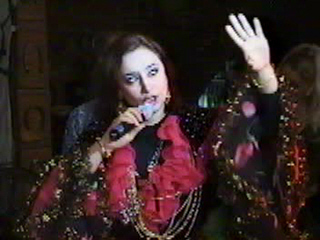 Legendary Gypsy singer Zhenya Shevchenko (1927-2009) has hired "Moscow Gypsy Army" to accompany her performance at the in New York City in 2008. 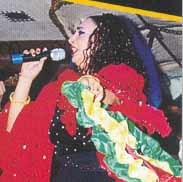 Famous Russian Gypsy singer Vasily Yankovich-Romani who was named the best Gypsy Roma singer in the United States has joined the group for the concert at the Great Falls Performing Arts Center in Paterson, New Jersey (2009). 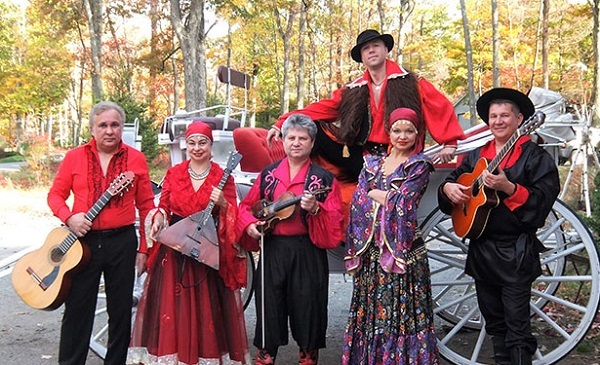 Moscow Gypsy Army (Russian: «Московская цыганская армия») is available for corporate events, birthday parties, fashion shows, sporting events, theme parties, graduations, product launches, promotional events and other private or corporate functions and events in NYC, New York, New Jersey, Connecticut, Maryland, Pennsylvania, Poconos, Florida, other states, and internationally as one powerful ensemble of ten musicians, eight dancers, and six singers or in smaller groups to fit into any budget. Heritage Festival in Maryland. (U.S. Army photo by Sgt. Kalie Jones). Dancers Dinara Subaeva, Vladimir Nikitin, Serhiy Tsyganok. 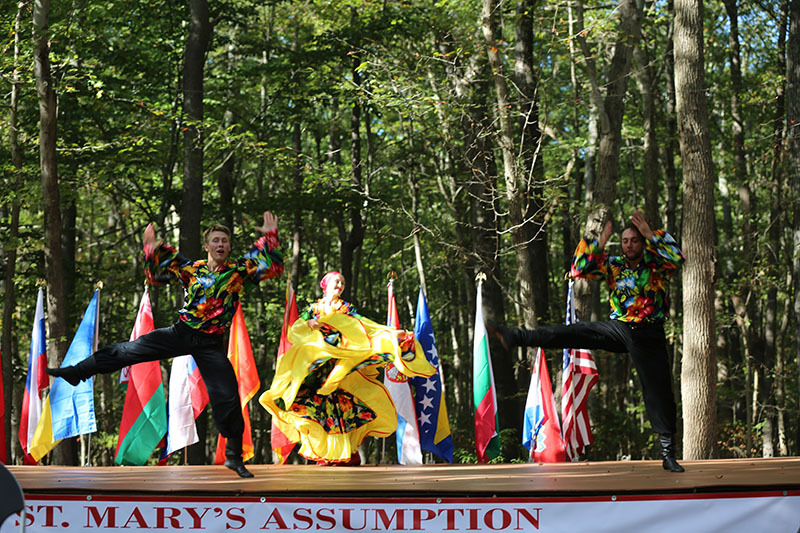 Dancers Dinara, Vladimir, and Serhiy performed during the Heritage Festival organized by St Mary's Assumption Eastern Rite Church in Maryland. The festival took place on Saturday, October 7th and Sunday, October 8th, 2017 at the St Mary's Assumption Eastern Rite Church, 2807 Mountain Road, in Joppa, MD 21085. U.S. Army photo by Sgt. Kalie Jones. 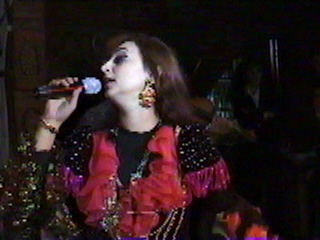 The company provided two hours music program including "Dark Eyes", "Kai One", "Two Guitars", "Shatritsa", "Vengerka", "Mato", "Chardash", "Ручеёк", "Мохнатый шмель", "Mardjandja", "Long Road (Дорогой длинною), and other Gypsy favorites during Russian Children's Welfare Society event at the diplomatic mission of the Russian Federation in New York City on Thursday, October 22nd, 2015. 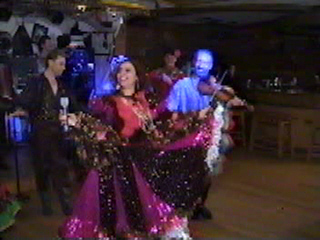 The company performed Gypsy Roma standards including "Mardzandza", "Mato", "Dark Eyes", "Two Guitars", "Kai Yone", «Мохнатый шмель», «Ручеёк» and other songs, popular Gypsy tunes, and dances during very special private Birthday party at the Horse Farm in Pennsylvania's Pocono Mountains on October 21st, 2015. Мероприятие включало в себя неожиданную встречу гостей в лесу с медведем и цыганским хором, катание на лошадях в сопровождении цыганской музыки, романтический ужин у костра на горе под аккомпанемент цыганских песен, танцев и музыки. 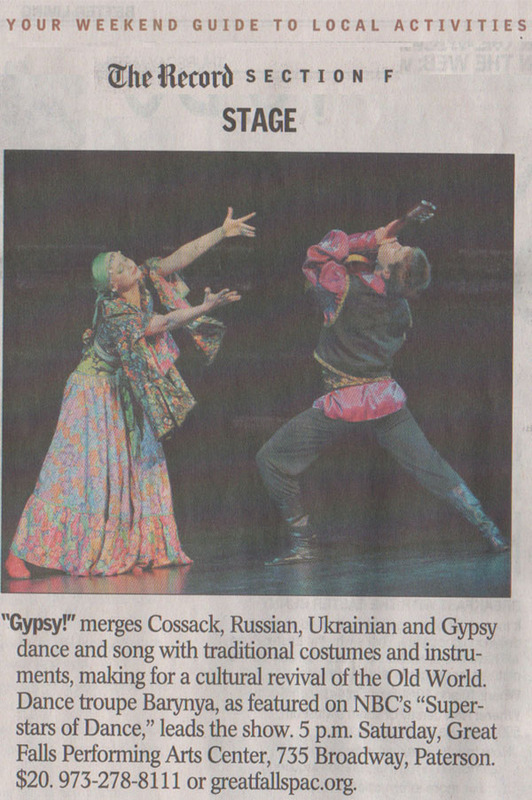 "Moscow Gypsy Army" presented a program of Russian, Cabaret, and traditional Gypsy-Romani songs, instrumental numbers and dances in Clearwater, Florida. Performance took place on Saturday, June 4th, 2016 from 7:30-9pm at the World Headquarters of the Church of Scientology in Fort Harrison Hotel, 210 S Ft Harrison Ave, Clearwater, FL 33756. 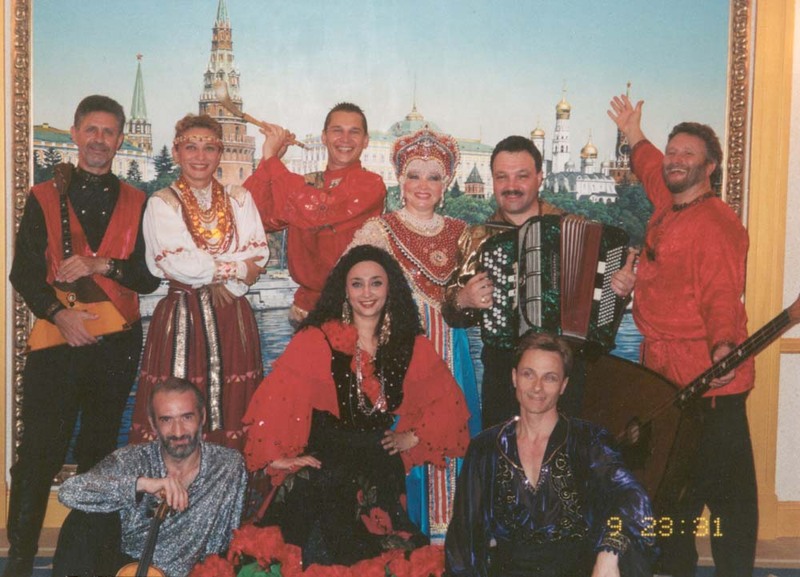 Cast of performers: Elina Karokhina, Mikhail Smirnov, Alexander Rudoy, Anna Brovkina, and with music and dance band lead by Daryal Kafkasso Erdem. 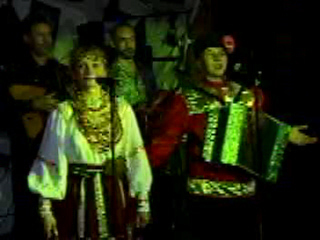 Program of performance included "Dark Eyes", "Two Guitars", "Shatritsa", "Chardash", "Мохнатый шмель", "Mardjandja", "Long Road" ("Дорогой длинною"), and other selections. 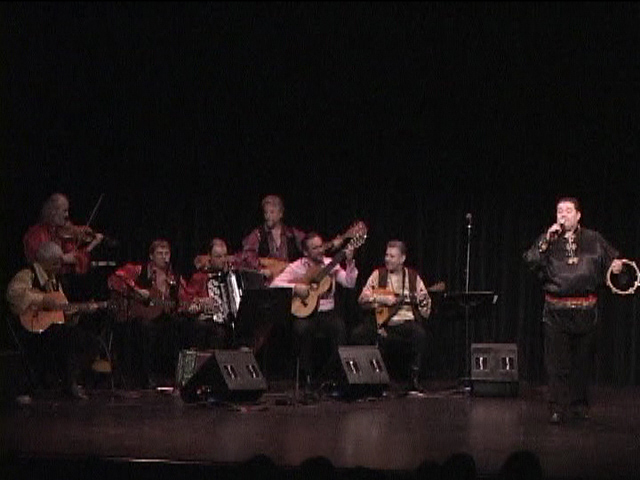 Vasiliy Yankovic-Romani led the group to present traditional Gypsy (Romani) songs, instrumental numbers and dances in Great Neck, Long Island (New York) on Sunday, May 22nd, 2016, from 3 to 7pm during graduation party. 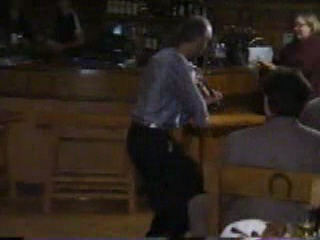 Program of performance included "Hey, Romale", "Dark Eyes", "Kai One", "Two Guitars", "Shatritsa", "Vengerka", "Mato", "Chardash", "Ручеёк", "Мохнатый шмель", "Mardjandja", "Long Road" (Дорогой длинною), and other Gypsy favorites. 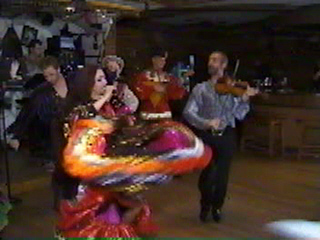 Vasiliy performed with balalaika virtuoso Elina Karokhina, dancer Alisa Egorova, and singer/guitar/accordion player Mikhail Smirnov. Pictures were taken by photographer Dalia Bagdonaite at the concert on January 26, 2008 in New York City. 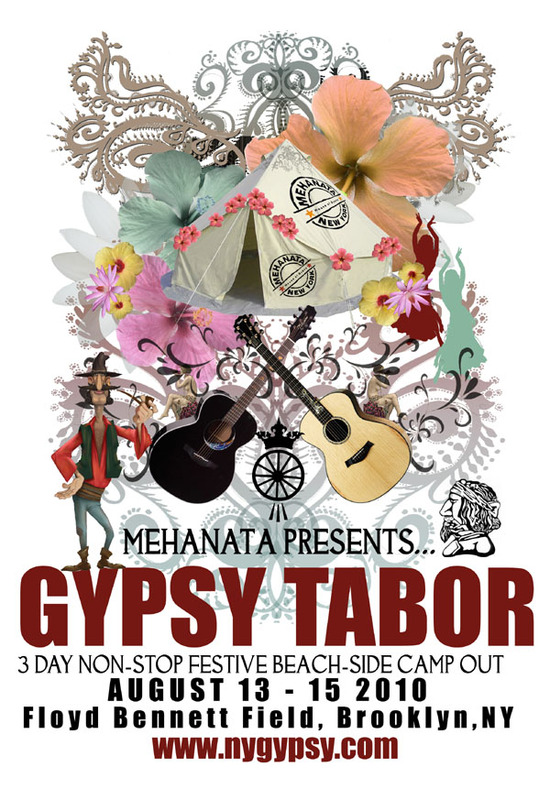 LIST OF PERFORMERS: Legendary Russian Gypsy singer Zhenya Shevchenko, Sergey Ryabtsev - violin, Mikhail Smirnov - garmoshka, vocal, guitar, Alex Siniavski - Gypsy guitar, balalaika, Alexander Menshikov - Russian Gypsy singer, Leonid Bruk - balalaika-contrabass, Gennady Gutkin - bayan, Lev Zabeginsky - balalaika, Andrij Cybyk - dancer, choreographer, Ganna Makarova - dancer, Olga Chpitalnaia - dancer, Vitaliy Verterich - dancer, choreographer, Valentina Kvasova - dancer, singer, Mikhail Nesterenko - dancer, Victoria Pichurova - singer, Gabriel Yakubov - Gypsy dancer, and Vasily Yankovich - Russian Gypsy Roma singer. January 10, 2010. New York City Hilton Hotel, 1335 Avenue of the Americas New York, NY 10019-6078 (West 53rd Street and 6th Avenue), MORGAN SUITE, Second floor. 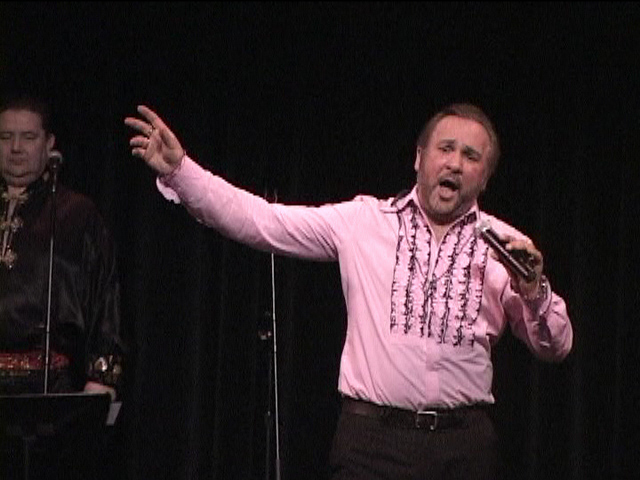 Showcasing during the Association of Performing Arts Presenters (APAP) booking conference. Free admission. 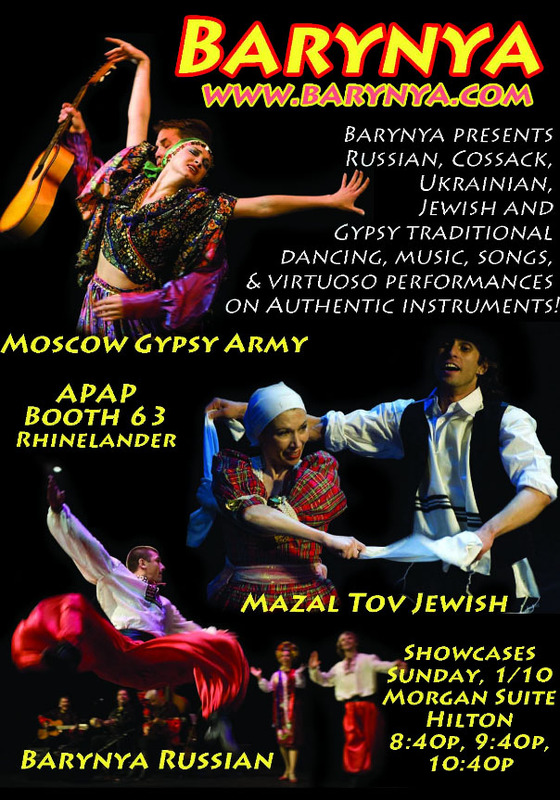 The program of the this unique show includes 45 minutes of traditional Russian folk and Roma (Gypsy) popular folk songs and dances. Over 15 authentic musical instruments are utilizing by profesional musicians. 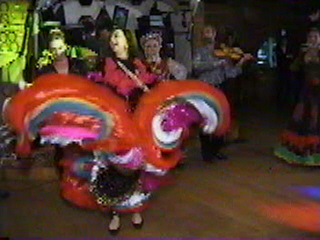 Colorful stage custumes. Program of Russian Gypsy folk show "Moscow"
"I walk down the Moscows streets" - famous Russian tune from the early 60th performed by the Russian Folk Band: Gennady Gutkin (bayan), Lev Zabeginsky (balalaika), Sergey Riabtsev (violin) and Leo Bruk (balalaika base). "Saturday affair" - jocose folk Russian song about the the young girl who explains to her boyfriend how he should behave. She says "you have to bring me lots of presents, take me out all the time, you should not kiss me, but only hug.". 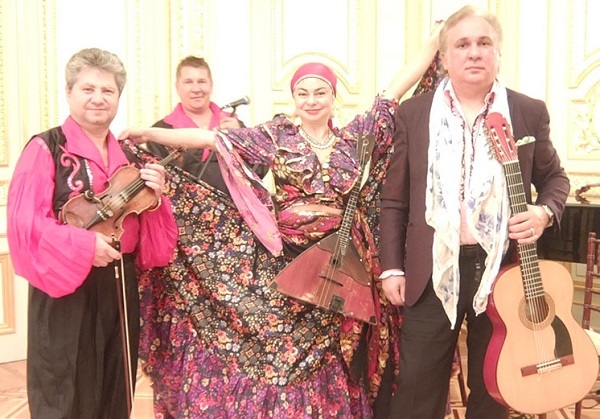 Performed by Irina Zagornova, Natasha Smirnov, Misha Smirnov and Russian Folk Band: Gennady Gutkin (bayan), Lev Zabeginsky (balalaika), Sergey Riabtsev (violin) and Leo Bruk (balalaika base).
" 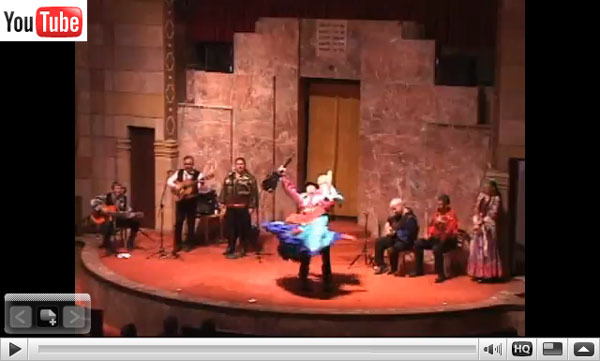 - cossacks playful song and dance performed by Irina Zagornova, Natasha Smirnov, Misha Smirnov and Russian Folk Band: Gennady Gutkin (bayan), Lev Zabeginsky (balalaika), Sergey Riabtsev (violin) and Leo Bruk (balalaika base). "Marusya, 1,2,3!!!" 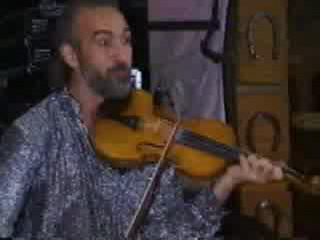 - an old Ukrainian folk song performed by Irina Zagornova, Natasha Smirnov, Misha Smirnov and Russian Folk Band: Gennady Gutkin (bayan), Lev Zabeginsky (balalaika), Sergey Riabtsev (violin) and Leo Bruk (balalaika base). and Russian Folk Band: Gennady Gutkin (bayan), Lev Zabeginsky (balalaika) and Leo Bruk (balalaika base). 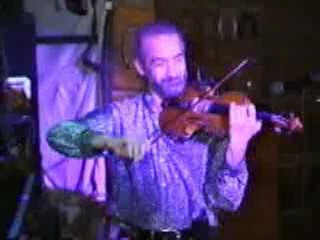 "There is no grief" - famous Russian romance performed by Irina Zagornova and Russian Folk Band: Gennady Gutkin (bayan), Lev Zabeginsky (balalaika), Sergey Riabtsev (violin) and Leo Bruk (balalaika base). "At the Blacksmiths" - authentic blacksmith's work song accompanied by authentic Russian rhythmic folk instruments performed by Irina Zagornova, Natasha Smirnov, Misha Smirnov and and Russian Folk Band: Gennady Gutkin (bayan), Lev Zabeginsky (balalaika), Sergey Riabtsev (violin) and Leo Bruk (balalaika base). "The Moon is shining" - well known Russian folk tune. 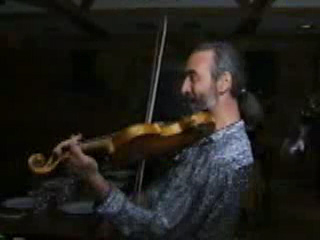 Balalaika solo performed by Lev Zabeginsky and the Russian Folk Band. 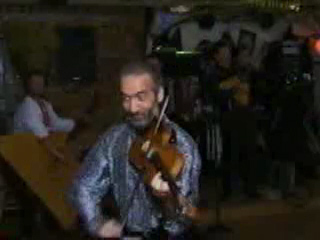 Russian Medley: "Moscow Nights" (Popular Russian lyric), "Katiusha"(Popular Song from the period of W.W.II) and Russian folk dance "Kalinka" performed by Yuriy Vodolagaand Russian Folk Band: Gennady Gutkin (bayan), Lev Zabeginsky (balalaika), Sergey Riabtsev (violin) and Leo Bruk (balalaika base). 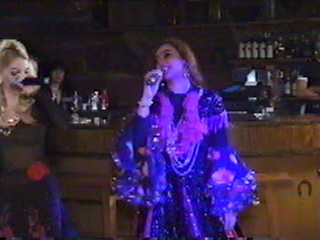 Russian Cabaret "MOCKBA" (Moscow) in 1998 by Walter Koulakov. A young man falls in love with awesome beauty Natalia. In jest he thinks to kill himself, then he rethinks to kill her. But the knife is broken, the pitchfork is bent and Natalia is still alive. Профессиональные танцоры, певцы, виртуозные музыканты. В прогорамме русско-цыганского шоу цыганских популярные танцы и песни. Чтобы заказать выступление шоу, получить брошюру или видеокассету с записью выступления ансамбля, обращайтесь по адресу, указанному на страничке с контактной информацией.